In the previous “how does it work” blogs, we have focussed on the way that RockTape can help to reduce pain, and how it can help to reduce swelling and assist recovery. In this edition, we are going to focus on the use of RockTape for posture and body awareness. To recap, RockTape is a kinesiology tape, sometimes referred to as an elastic therapeutic tape. It is very stretchy and as such is designed to move with the person, not restrict movement like traditional rigid tape does. Being very stretchy, RockTape recoils along its length and in doing so, creates a lifting effect on the skin. The lifting effect is thought to stimulate the many “mechanoreceptors” in the skin/superficial tissues and send more information to the brain from the taped area. By sending more information to the brain, RockTape can be used to make someone more aware of how they move. This can improve their posture or technique and possibly even prevent injury or make them more efficient in their chosen activity. Maintaining better “form” should ultimately make someone more efficient and less likely to get injured, but perhaps also more resistant to fatigue. This is often why high-level athletes may have tape applied during training or even competition. It may not be because they are “injured”, but to ensure that they maintain better form as they fatigue, particularly in an endurance type events. This is an interesting finding that has been replicated several times in various studies – applying kinesiology tape can reduce the negative effects of fatigue. This can be anything from maintaining better muscle function, or maintaining better balance, and these studies have shown benefits from taping compared with those that aren’t taped. Interestingly, the relative improvements from being taped are evident after a fatiguing testing protocol, but not at baseline. 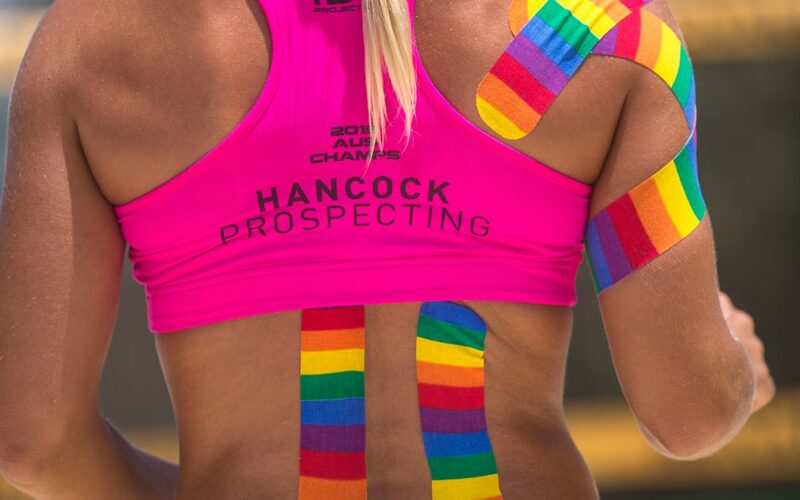 RockTape is often thought of as a sports tape. But for the majority of the population, sport is a hobby or pastime, and the real stresses and strains on the body can come from everyday activities and in particular occupational loads. Most of us have a job that is repetitive in some way, and we generally lack variety in our day to day or week to week tasks. This means that postural overload is a part of everyday life for many people. RockTape helps thousands of people every day to manage the sustained postures associated with their normal daily activities. This could range from people doing physical work such as tradies, to sedentary occupations, to kids with “text neck”. Many people with chronic and long-term disabilities use RockTape to help them manage their symptoms and improve their movement patterns or postures. RockTape is hypoallergenic, containing no latex or zinc oxide which are the two main substances that irritate people using some wound dressings or rigid tape. This makes it suitable for most skin types and people of all ages. RockTape can also be worn for 3-5 days as the lightweight fabric can “breathe” and therefore moisture is not trapped under the tape. All of which can help to improve performance, whether that be in sport or everyday life!